Babies grow quickly. The first time they smile, the first time they roll over, their first word – all these milestones seem to whiz by in the blink of an eye (blinking: another milestone!). 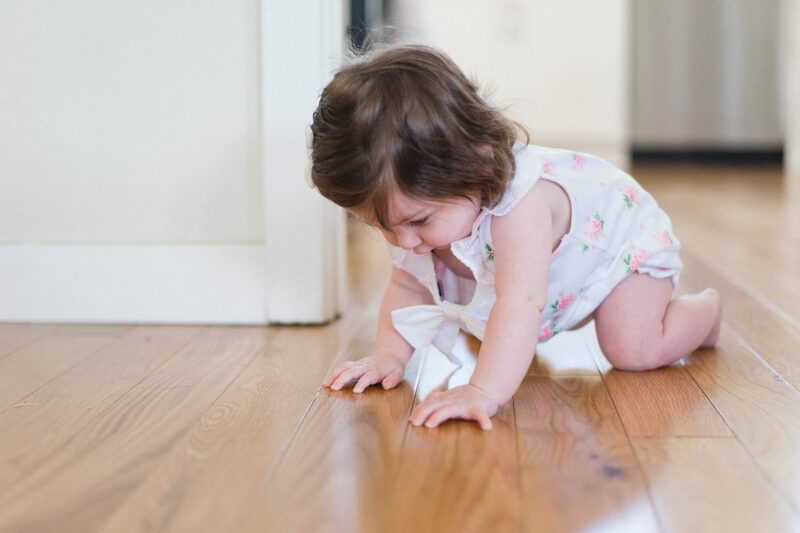 Before you know it, your baby is crawling… and he’s crawling fast. The living room becomes his jungle gym, the kitchen his playground. But these rooms are set up for adults, not babies. And since little ones are hardwired to touch, taste, and poke just about everything in sight – after all, that’s how they learn – baby proofing is essential. Lisa Lewis, M.D. and author of Feed the Baby Hummus, recommends starting as early as possible. Since each household is different, she recommends giving yourself plenty of time to think through what needs to be done to babyproof your own home. You already know to put your baby to sleep on her back to prevent SIDS. But there are a couple of additional steps that parents need to take to make sure their child’s crib is safe. First, keep all toys, stuffed animals, and blankets outside of the crib during sleep time. These, and any other objects, can pose choking hazards for a sleeping baby. Always dress baby’s crib with a firm mattress and fitted sheet. Ensure baby’s changing station is safe by keeping all small objects out of reach. Always use the safety belt when changing baby, and do your best to keep your hand on her at all times to prevent falls. 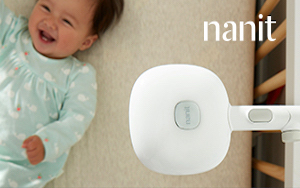 And remember: A top-quality baby monitor is like an extra set of eyes. Sharp objects, hot surfaces – for new parents, baby exploring the kitchen is like an anxiety attack waiting to happen. Make sure every base is covered in the kitchen so baby can safely get to banging pots and pans. To baby-proof the stove, remove the stove knobs (these are usually as easy to remove as simply twisting them off) or use stove knob covers. And cook on the rear hot plate whenever possible, to prevent little hands from getting burned. If you absolutely must cook on the front burner, turn the pot or pan handle inwards to prevent it from falling over. Hide all cleaning supplies and kitchen accessories, either high out of reach or in a cabinet sealed with cabinet locks. Generally speaking, all pull-out drawers (such as the one under the oven) or cabinets should be kept locked. Magnetic locks are great for childproofing without sacrificing the aesthetic of a kitchen. When loading the dishwasher, make sure knives and other sharp items are pointing downwards, so baby can’t touch the blades. Always wait to add detergent liquid or packs until you’re about to run the dishwasher – with their sweet fragrances, children might confuse them for candy. If you have any freestanding shelves, ladders, or stools, The Kitchn recommends either screwing them into the wall or keeping them tucked away so they don’t tip over. Keep all candles, matches, photo frames, and remote controls stowed away. If an object is small enough to fit in baby’s mouth, keep it out of reach. If possible, mount your television to the wall, since children may try to climb on a TV stand. Replace or cover any sharp edges, like shatter-prone glass tables. Vacuum often, taking care to scan under the sofa and other low-to-the-ground spots, so you can remove any small objects (e.g., stray paper clips or batteries) that baby could easily reach and swallow. Make sure there aren’t any dangling cords or curtain strings in the play area, as they pose strangulation threats. Most blinds are now made without low dangling cords, Dr. Lewis points out, but gather any cords on older mini-blinds with a cord wind-up. Dr. Lewis also recommends ensuring that the floor is slip-proof. “When children are learning to walk, they fall easily. Adding a rug to a tiled or hard wood floor helps reduce painful injury with a fall,” she says. Bathrooms tend to be rife with baby-proofing headaches, ranging from cleaning supplies to personal and beauty products. The easiest way to baby-proof the bathroom is to keep it securely closed when not in use; install a hook-and-eye closure out of your child’s reach. And then there’s the toilet: In addition to being epicenters for germs, they posit a drowning threat. To prevent your baby (especially toddlers) from reaching in, install a toilet lock. While you’re at it, hide the toilet brush. A toilet paper guard is also a good idea to prevent little ones from flinging TP every which way; in a pinch, you can use a rubber band or hair tie to secure the roll. Place an anti-slip mat on the bottom of your bathtub to prevent baby from slip-sliding around during bathtime. If you’re worried about your little one bumping her head on the tub spout, you can get a bathtub faucet cover. Dr. Lewis recommends installing smoke and carbon monoxide detectors near the living room, each room your family sleeps in, and on each floor of your home. Test your smoke and carbon monoxide detectors once a month to ensure that they work. Keep all outlets covered with outlet plugs or large pieces of furniture. Baby-proofing will save you a world of headaches, and provide time to witness baby’s small joys and milestones. Feel free to indulge your child’s curiosity, and relax knowing he’ll be able to safely explore.